Hello everyone! Welcome to the Week 17 Friday Staff Cash Plays for FanDuel! Before we plunge into the details of the staff lineups for Sunday, I will address the special problems that Week 17 presents to fantasy owners. In a word - unpredictability. As many teams are eliminated from playoff contention, they may elect to play backups/players recently promoted from practice squad extensively in Week 17 to begin the process of planning for the 2016 NFL Draft and free agency. We don't know with certainty how long a lot of starters are going to be in games. In particular, the Washington/Dallas game appears to be one in which the Washington coaching staff is going to sit down normal starters, because they cannot improve or degrade their playoff seed by the outcome of Week 17. There are other situations where teams may elect to pull their starters or some of their starters around half-time or at the beginning of the fourth quarter (Andy Reid has often done this when playoff-bound - it's going to depend on if the Chiefs get up in a big way on Oakland early in the game) . Just because a team "has something to play for" doesn't necessarily mean that the usual starters will be in the Sunday games for a full 60 minutes. In short, fantasy owners should be aware/beware of games like WAS/DAL, STL/SF, PHI/NYG etc. where neither team has anything at stake regarding post-season, and should also beware of games where teams might pull starters part-way through - games like OAK/K.C. ; NE/MIA; TB/CAR - where one team has a clear possibility of blowing out the opposing team in short order and then may elect to squat on the lead with their backup players. The above being said, let's look at the lineups submitted by Footballguys.com fantasy owners for their cash lineups this week. There are only five such lineups submitted as of posting-time for this blog article - which may indicate that a lot of Footballguys are going to skip Week 17 entirely. As I noted in another article for the site: "...once Wild Card Weekend arrives we know that that players will be leaving it all on the field as they strive to advance to the next round of the tournament." Of the lineups submitted, there are some notable trends - Ryan Fitzpatrick ($7,800) is on three of the five lineups in the have-to-have-it game against Buffalo. As the Rex Ryan vendetta against New York is well known, the owners (myself included) expect that Buffalo will play their #1's throughout the game, and thus it is very likely that the Jets do so as well. Two of the Fitzpatrick owners (myself included) are stacking Fitzpatrick with Brandon Marshall ($8,600). In fact, I am stacking both Marshall and Eric Decker (7,400) with Fitzpatrick - not something I would do in a normal week for a cash game, but for this week where I am playing entries I am looking to ensure maximum playing time, and I believe that both Marshall and Decker will A). play the full game and B). both be heavily targeted by Fitzpatrick. My running backs include Karlos Williams (who I think will play the full game and be the lead back against the Jets) and Tim Hightower (who is already subbing for an injured starter, and Hightower is seizing his current opportunity to try and re-start his NFL career, so I expect an excellent effort from him despite New Orleans being out of the playoff picture). 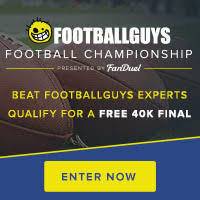 No Consensus on Running Backs - the only running back on more than one lineup is DeAngelo Williams ($8,200) and he is on only two of the lineups. The search for a quality amount of playing time during Week 17 is leading the Footballguys in different directions. Four of the five teams have Josh Brown ($4,600) at place kicker this week - they evidently believe that the Giants will score a lot of points against Dallas. This is not a viewpoint I agree with, by the way, as I think Ryan Nassib vs. Kellen Moore may wind up being a low-scoring affair. I'm on Randy Bullock as I think the Jets will score many times against the Bills.